V1690. 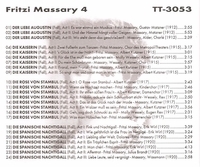 FRITZI MASSARY, Vol. IV: Arias & Duets (w.Gustav Matzner, Else Alder, Albert Kutzner, Molly Wessely, Eugen Rex, Erik Wirl, Hans Wassmann, etc.) from Der Liebe Augustin, Die Kaiserin, Die Rose von Stambul & Die Spanische Nachtigall (all Leo Fall). (Germany) Truesound Transfers 3053, recorded 1912–20. Transfers by Christian Zwarg. “Fritzi Massary was discovered and engaged by the director of the Berlin Metropolitantheater, where she appeared primarily in revues. This was the decisive turning point in her career: at Berlin’s various revue theaters, the cheeky soubrette, ‘the Massary’, became a master of the performance arts, the idol of an entire generation. While she had her first sensational success in revue in 1904, the real breakthrough occurred in 1911, when she appeared as guest artist at Max Reinhardt’s Künstlertheater in Jacques Offenbach’s LA BELLE HÉLÈNE, alongside Maria Jeritza. From then on she reigned over the Berlin stage, which was at the time the center of cabaret, revue and operetta. Among the works created especially for her was the operetta DIE KAISERIN (The Empress) by Leo Fall (1915). Under Bruno Walter she sang the title rôle in Franz Lehar’s THE MERRY WIDOW and Adele in Johann Strauss’s DIE FLEDERMAUS. Until 1930 Massary first nights were the highlight of every season and Berlin was overcome by a regular Massary-fever. Attempting to define the secret of her success, Oscar Bie, the author of a work on Fritzi Massary, observed her during rehearsals and commented, ‘The moment she walks on a stage, she becomes another person. Suddenly a desire to act surges through her body. … No matter what part she’s playing, whether it’s a dialogue, song, conflict, it overwhelms her like an inner vision’. According to her friend and adviser Alma Mahler-Werfel, she brought her intelligence to the stupidest operettas and thus ‘made the impossible credible’. Although we can no longer see her onstage, we can still hear her on recordings which testify to her masterly performance art.